You probably recognise the term “vinyasa” as a popular style of yoga but it also refers to a particular pattern of action: chaturanga-to-updog-to-downdog. Your body may be down with all of these chaturangas, or it may not. Perhaps the first several chaturangas feel great, but then it goes south. Maybe the classic “vinyasa” series just doesn’t feel safe right now because you have an injury. All of the above are valid sentiments in a community of ever-changing individuals. One definition of “vinyasa” is “to place in a special or purposeful way.” When we look at the classic “vinyasa” sequence, there are are a lot of benefits, including: strengthening (plank and chaturanga); neutralizing (utilizing both forward folds and backbends); rhythmic and meditative (synching movement and breath and bringing us into the moment). If you know some alternative vinyasas, and if you stay in tune with your body, breath, and energy as you flow, you can intuit what you need in a given vinyasa or sun salutation: more strengthening (sthira)? More ease (sukha)? More meditation through movement and rhythmic breath? Pause? Then find a pose or combination of poses that embody that. NOTE: If you're working with injury, ask your doctor what positions and/or actions (extensions, flexions, and ranges of motion) are appropriate or risky. Also, listen to your body. Even if it’s considered a “safer alternative,” if a pose or pose variation feels painful, don’t do it. Here are 10 alternative vinyasas we will be working with this month, but feel free to explore and be creative (speaking to both teachers and practitioners). Simple idea that can have profound results in terms of strengthening. 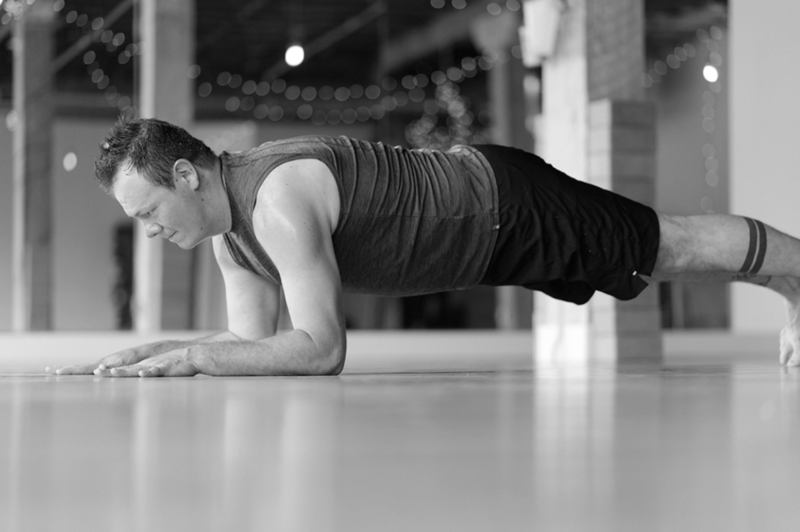 Skip the chataraga and updog and just take an extra breath in plank. Energize the heels and gaze slightly forward. focus on spreading the shoulder blades and pressing into the floor. Really tone the transverse abdominal muscles and notice if the elbows want to splay or the hips dip. If needed, you could even bring your knees down here to prevent compressing the low back. But once you’ve cultivated the core strength to keep your lower back safe and supported, see if you can press your thighs up without sticking your bum out. If you want the strengthening component, but you need a break from being on the hands and a time out for your wrists, drop onto forearms and enjoy some time in Forearm Plank or Dolphin. My personal fav and the ultimate strengthening alternative. Also, it may be that transition from chaturanga-to-updog that is problematic. It’s a lot on the shoulder! If chaturanga is fine and you want to keep it spicy, but skip updog transition, you can add the chaturanga push-up. You don’t need to go super low with your chaturanga, and you can modify with one or both knees on the floor (keep your knees behind your hips). Emphasis on keeping it slow when you lower will result in a pass through of chaturanga building strength and mindfulness. Once you are on the floor you can press to cobra, low cobra, or shalabhasana. A great opportunity to add an extra breath to strengthen the back body and elongate the rhythm of vinyasa. Skip the chaturanga and the backbend, and get more time in forward folding shapes that encourage you to draw inward, but still enjoy the strengthening aspect of plank. From Down Dog, sink the knees towards the floor for floating anahatasana, float forward to Plank and return to Down Dog. Great for practicing axial extension of the spine as well. If you need a break from movement and you just want to be still, hang out in down dog! Feel free to add variation like staking a hip or twisting. Keep flowing with the breath but take the effort back a notch by dropping into some cat cow. Just as it sounds! Blocks under the hands will take pressure out of the wrists and allow for more space. Space is a powerful idea to work with in your vinyasa flow. See how space enables clear transitions and a meditative rhythm. Tune in and breath. Have a moment of meditative pause to empower your practice.